These sweet and sour delicious short ribs are an adaptation of a Chinese recipe. I chose to have them cut thinly, but you can, of course choose any size. 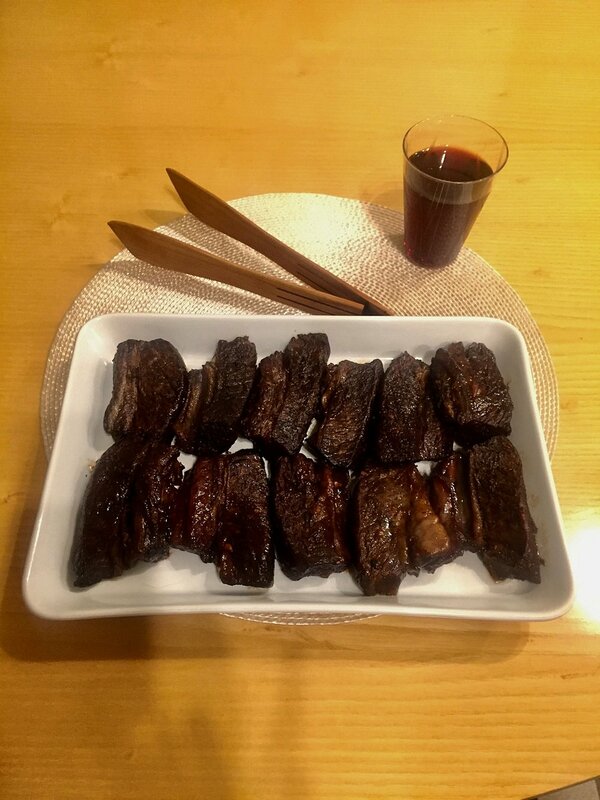 I feature another short rib recipe on my web site but this one is much simpler. I also do not use the sauce. It is a bit strong and is too time consuming to remove all the fat. Place the ribs in a nonreactive dish-such as Pyrex. Whisk marinade ingredients and pour over meat. Cover with plastic wrap and marinate for several hours or overnight. Place the ribs, meat side down, in a roasting pan that can hold them in a single layer. Pour the marinade over the ribs. Cover with heavy foil and roast for 2 hours. After 2 hours, slip the bones out of the meat. Pour off most of the sauce, which is really fat and return the meat to the oven for another ½ hour. The ribs should be very tender. If you have prepared the ribs in advance, you can reheat them in a preheated 350F oven, covered, for about 30 minutes.